Jack Kapp, 47, president and founder (1934) of Decca Records, died of a cerebral hemorrhage in Manhattan on March 25. 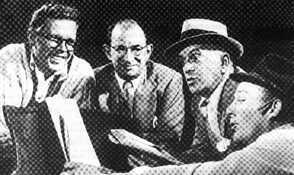 Kapp (second from left in the photo) combined a shrewd eye for business (Decca was the first to make 35 cent records on a large scale and the first to package popular records together as albums) with a sharp ear for talent (he signed Bing Crosby, the Mills Brothers, Al Jolson, the Dorseys) to lift Decca into a $30 million a year business by 1946. Kapp's career began in his home town, Chicago, where his father was a salesman for the old Columbia waxworks. Jack began as a shipping clerk at Columbia while he was in high school. After graduation he took a full-time job with Columbia, and then moved to Brunswick, where he met Bing Crosby in 1931. Kapp recalled in 1949: "I will never forget the first day I met Bing a little over 17 years ago in the lobby of the Roosevelt Hotel in Hollywood. He was wearing a crew-neck sweater and he had the same casualness then that distinguishes him today.... I remember how I appealed to him to come to New York .... I can still recapture the thrill of those first records in New York -- selections which included such subsequently standard classics as Where the Blue of the Night, Stardust, Dancing in the Dark and Sweet and Lovely." Kapp left Brunswick in 1933 and, with two partners, founded Decca Records in 1934. The first recording artist signed by Kapp for the new label was Bing Crosby. Soon Kapp had also signed Guy Lombardo, Ted Lewis, Ethel Waters, the Dorseys, the Mills Brothers, the Casa Loma Band and several other musical stars. To charges that Kapp had 'raided' his rivals, Jack answered that he was paying less money than rival companies and that the artists had followed him out of loyalty to him and faith in his new firm. Kapp's favorite recording artist was Bing Crosby. Kapp wrote of Crosby in 1949: "Bing has become the symbol of America and what it represents to all the peoples of the world. In his off-hand, unpretentious, and wholly native way, Bing is Mr. America...."
When Crosby was recording for Brunswick, Bing often whistled and boo-boo-bood when he recorded. At Decca Kapp persuaded Crosby away from the whistling and boo-boo-booing. According to Kapp: "My first objection to Bing's early style -- I wasn't as understanding and as tactful then as I hope I am today -- was that he should eliminate the 'boo-boo-boo-boo' manner, and that his accompaniment must really accompany him, instead of playing what Bing might like to hear." Crosby turned out to be Decca's best-selling artist. Bing, in turn, credited Kapp with keeping his career from becoming just another "flash in the pan." In his autobiography Crosby said of Kapp: "Every man's life is the result of what happens when his life touches the lives of others, and many people have influenced my life in one way or another. Sometimes, like Jack Kapp of Decca Records, they've helped me achieve things I never would have accomplished otherwise." Kapp was succeeded at Decca by his younger brother, Dave.